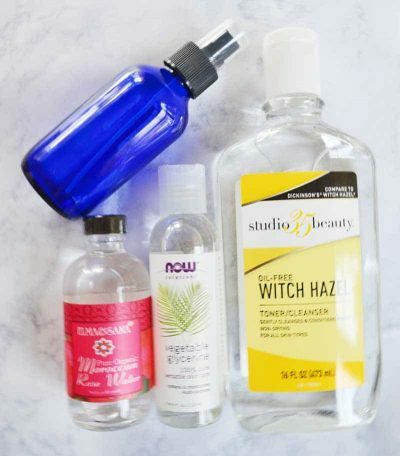 Did you know you can make your own makeup setting spray for a fraction of the cost of the most popular brands AND it works! Best of all, you can personalize it for your own preferences. Today I am going to show you the simple steps for this diy setting spray. I am a lover of the Urban Decay’s version of makeup setting spray and use it often. 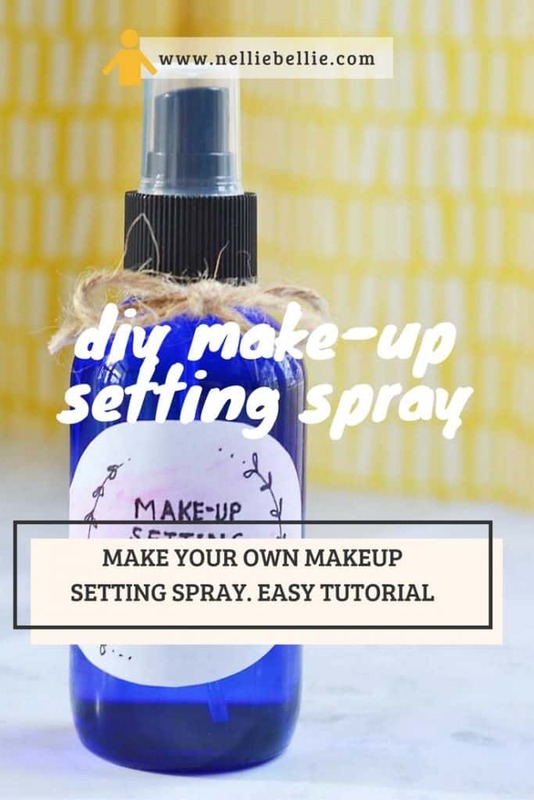 When I’m heading to an event, or for a day with little room for breaks, OR spending time outside in the summer at an event, I find that makeup setting spray is almost essential. Urban Decay’s costs a pretty penny for an itty bitty jar of the stuff, however, it works great but isn’t so great on my pocket book and, frankly, my face. My homemade setting spray is far less expensive than the big brand’s, makes a larger amount, and contains my favorite…rose water. It’s easy to make with ingredients found at your local health food store or I’ve included the shopping links to Amazon (where I grab all of my ingredients). Although I have to buy a bottle of rose water for every recipe, the glycerin and witch hazel last me through several recipes. Cost for the big brand’s version: $24.68 for 1 ounce. $98.71 for 4 ounces. Using a funnel (or very, very carefully :-) ), pour the veggie glycerin, witch hazel, and (optional) tea tree oil. Gently stir them together. Fill the bottle the remaining way up with rose water leaving a bit of room at the top. Replace the cap and gently roll the bottle to mix the ingredients together. Gently shake the bottle and spray about 12 inches away from your face. Note: I don’t add tea tree oil to my spray but if you struggle with acne, adding a bit of tea tree oil to your spray will be a great help! I would start with only 1/2 teaspoon to start and add more, if you like, in later recipes. Note: Adjusting the amount of witch hazel will increase or decrease (depending on your adjustment) the toning effect this spray has. Adjusting the amount of glycerin will increase or decrease (depending on your adjustment) the staying power your makeup has as well as the “filmy” feeling you may find. If the rose water is too strong for you try using filtered water as a substitute. I still keep a small bottle of theUrban Decay’s of setting spray in my purse for when I need a quick refresh on a busy day. But, this homemade setting spray is my go-to version I use quite a few days a week. I love the rose water for its refreshing quality and the witch hazel as a quick toner. You know, I am not an expert in this. I do know that rosewater is good for helping restore the ph balance to your skin. So that would be helpful. Also, witch hazel and tea tree oil are good for oil. Sadly though, I don’t know enough to be a good source for expert advice. So sorry! Can I use water instead of rose water? I’m not positive. I’m sure that you could use it but it may not have the same results. Rose water refreshes your skin and is a great use for beauty. You would probably get the same setting power, though. If you try it…let me know how it works!